The goal of the Learning Journey Platform is to make Learning Power improvement accessible to anyone with a smart device. Helping everyone to succeed not only in their study, but also in their work and in the community. Developed through 18 years of academic research, the Learning Power platform and previous versions have been used over 120,000 times to help individuals and teams improve their capacity to learn. With the ability to support multiple languages and tones of voice tailored to each audience, it is a unique capability that enables continuous Learning Power improvement throughout the journey of a learner – from school, to college, to university and into work. It’s also a powerful tool for supporting community engagement – addressing shared problems that matter. With an obvious home in Education, the Learning Journey Platform is increasingly being used by Business around the world to improve performance by increasing the Learning Power of individuals, teams and organisations, enabling them to transform, adapt and succeed. Its a new and unique opportunity to build sustainable Learning Power improvement into individual and organisational learning. It is more than just a diagnostic tool – it supports the entire Learning Power improvement cycle, from purpose to performance. The first stage in any learning journey is understanding why you are attempting something – establishing purpose. The platform makes this very simple, guiding you through a series of questions that tease out the purpose. 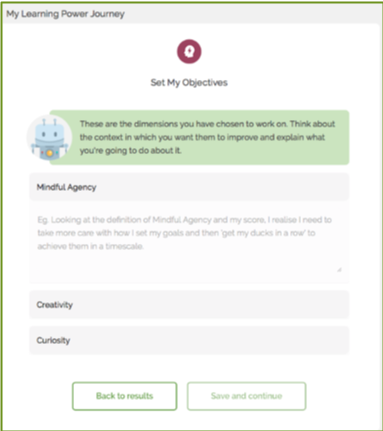 Next, the platform takes you through the Learning Power profile, answering simple questions about how you think, feel and behave while learning. 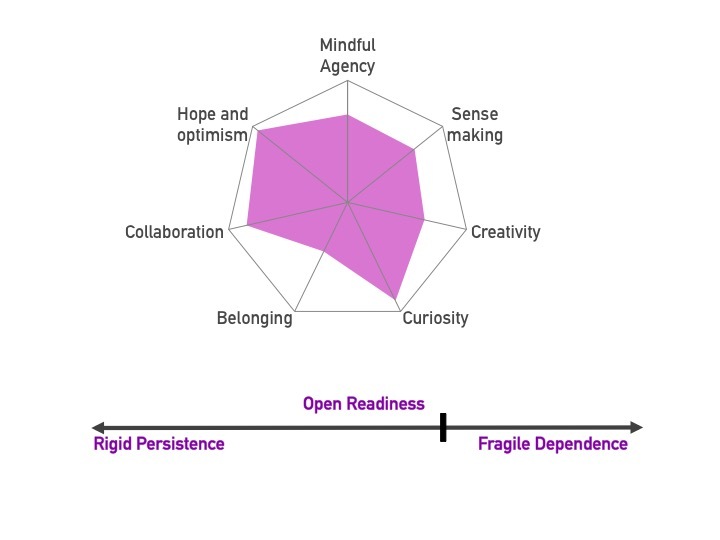 Based on these answers, a personalised Learning Power profile is generated, helping you to understand your capacity to learn based on eight dimensions of learning. Being able to improve your Learning Power is at the heart of the platform. 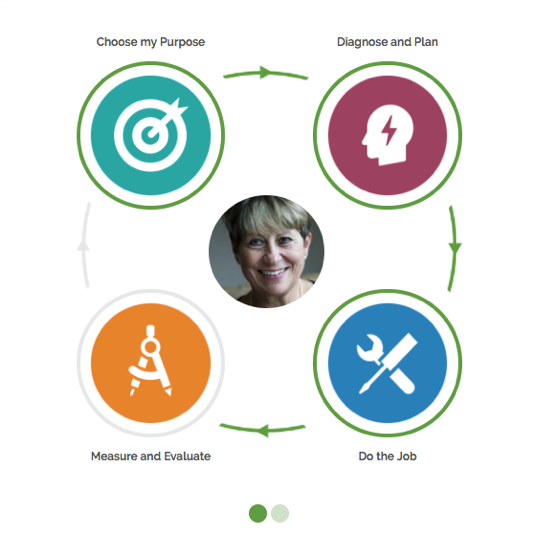 By identifying which learning power dimensions to improve, you give a new shape to your profile, creating a visual target for your improvement plan. 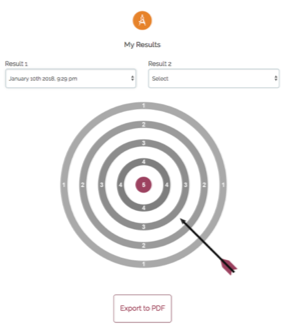 The platform makes this easy by enabling you to drag and stretch your selected dimension scores on the spider diagram of your Learning Power profile and by prompting and recording the improvement strategies you create which enable you to achieve your targets. The next step is also simple, but often overlooked – it’s about putting a plan into action and doing something differently, to practice and improve your Learning Power. We call this Doing The Job. It is when Learning Power is used in action to build new knowledge, achieve goals and create new value. 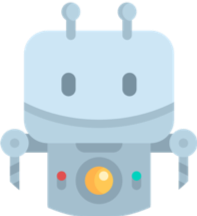 To help you on your journey, we have created your own ‘buddy’ that will offer personalised help along the way. Offering helpful hints and tips, this will make sure you get the most out of your learning journey. The last step in any learning journey is to measure the progress made against your learning objectives. The platform makes it easy to retrieve and compare previous learning power profiles and to track your progress over time. The platform also provides access to the underlying data to enable valuable analytical insights, for coaches and leaders, of the individual and group feedback. Access to this level of learner data is ground-breaking as it allows for integration with wider data sets for further analytical insight and to drive Research and Development opportunities. The most important unit of change is the story and identity of the learner – not the teacher, the curriculum or the measurement model. Legacy systems tend to privilege the content of the curriculum, a reductionist measurement model and the teacher as agent of change. 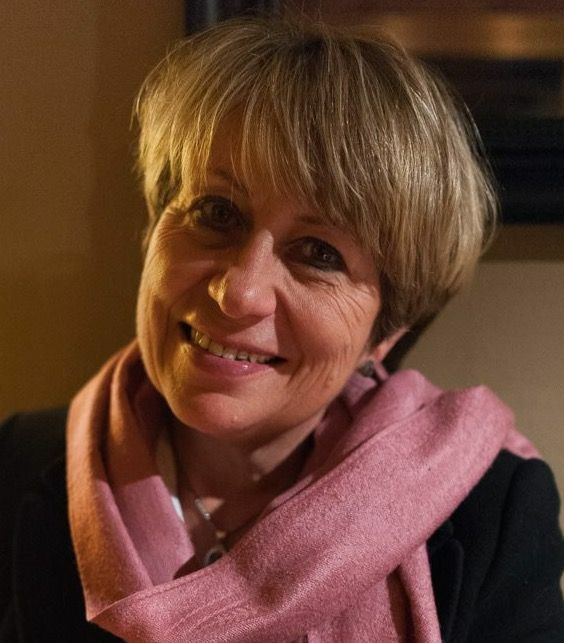 The challenge for learning analytics is to build a digital infrastructure based on a data architecture which provides a ‘singl e view of the learner’, where data belongs to the learner and can be used, one student at a time, across transitions, and in real-time, for better decision-making as they navigate their way through complex problems to solutions that matter to them. This is sometimes described as a call to move towards Education 3.0 – a challenging worldview shift from a top down, individualist and dualistic worldview (Education 1.0) towards an integral, participatory and wholistic one. For a discussion about these ideas see the first Handbook for Learning Analytics and a chapter called Layers, Loops and Processes. 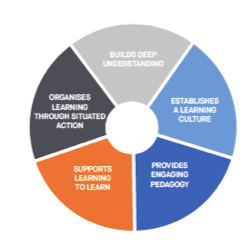 I want to focus on the challenges and opportunities of building such a Digital Learning Infrastructure and will use examples from the new Learning Emergence Learning Journey Platform. The first release of the platform is live with a group of schools in the UK an d with another group of schools in the Hunter, NSW, sponsored by Hunter Water Corporation. Hunter Water are using the same Learning Journey Platform as a vehicle for cultural transformation as they move into the uncertainty and challenges of infrastructure resilience and sustainability for the future of the region. 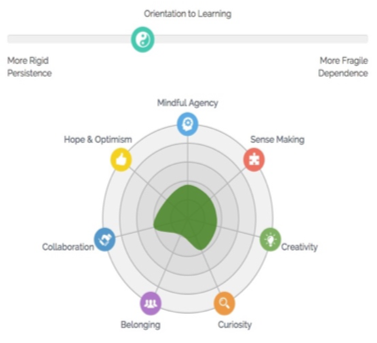 The purpose of the Learning Journey Platform is to enhance self-directed learning capabilities, and thus the resilient agency, of students, teachers and leaders and schools across the world. 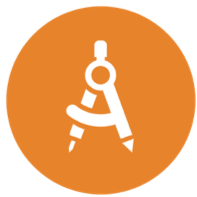 It provides scaffolding support for people in authentic enquiry learning journeys which contribute measurably to data-informed local solutions that matter and empower self-directed, resilient learners. ‘Learning Power’ is a term which describes this approach. Resilient people are a pre-requisite for resilient and sustainable practices at all levels of society. See this link for an introduction. Rapid feedback of meaningful data is key to enhancing self-directed learning. 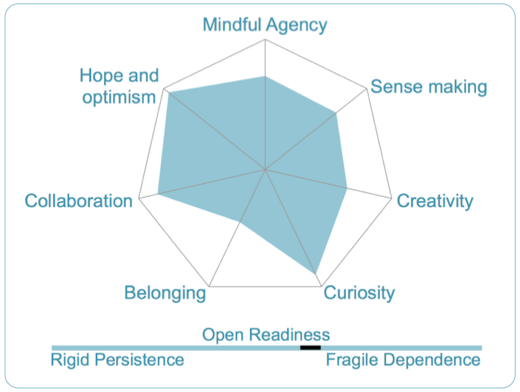 The Learn ing Journey Platform hosts the CLARA learning power assessment tool, the TESAteacher development tool for pedagogy which supports deep student engagement and Angela Duckworth’s GRIT survey. Feedback to the user is immediate and provides a framework for reflection – ‘backwards’ towards identity and purpose and ‘forwards’ to a particular purposeful outcome. A key design principle underpinning the Learning Journey Platform is that learning is a journey that begins with a purpose and moves towards an outcome or ‘performance’ of some sort. When a student defines and owns their own purpose – the why – they are at the beginning of resilient agency. They need to use their learning dispositions – their learning power – to understand themselves as learners and to figure out how to move towards their purpose. The what is the data, information, experience and new knowledge they need to identify, collect, curate and re-construct in order to achieve their purpose. This is a familiar enquiry cycle for most educators – the key difference here is the emphasis on purpose and agency and self-directed navigation. It’s also a process that is core to improvement science approaches. The learning journey metaphor is simple and yet profound in terms of mind-set shifts. A person leads a journey, you can be on your own or with others, there’s a terrain, a map if you’re lucky, challenges, diversions and a destination. Journeys have endings and beginnings and way-points, and come in all shapes and sizes. The Learning Journey Platform builds on best practice in data architecture from FinTech in customer journeys and uses AI to support the individual learner in navigating their learning. Whereas in the commercial world the focus is on the ‘next best action’, in the world of learning the focus is on the ‘next best offer’. Dialogue and discourse are at the heart of learning. 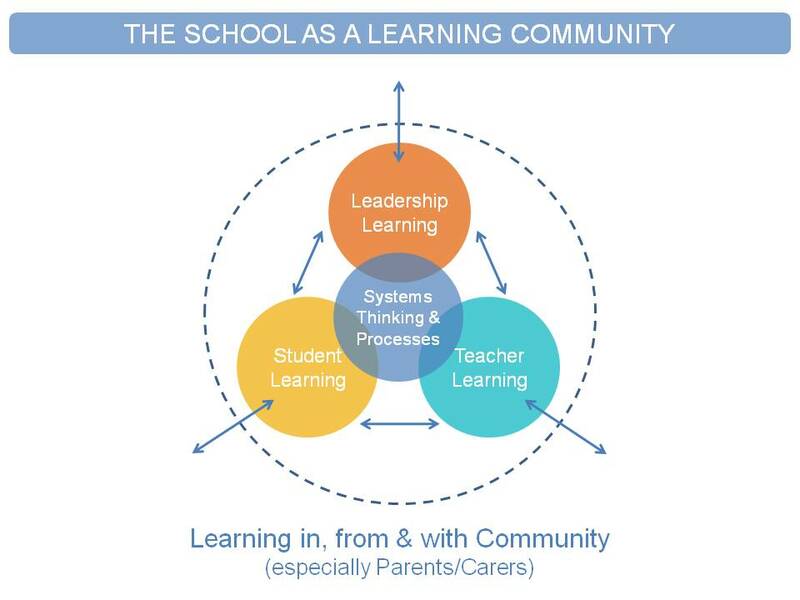 Schools are complex living systems which are multi-layered. We know how important teacher professional learning is – you can’t give what you haven’t got. Moving towards education 3.0 means to be part of a worldview shift which is happening around us because of the challenges of life in the 21C. A worldview shift of this type is uncomfortable and challenging. It’s best encountered and managed through deep professional learning – for leaders and teachers. 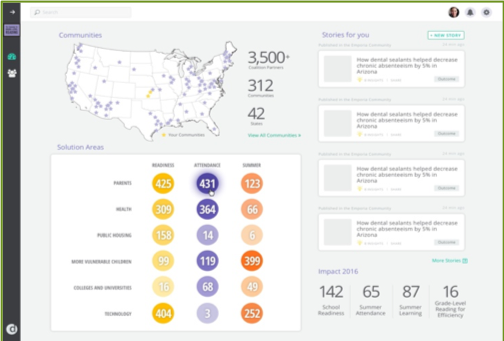 The Learning Journey Platform captures the data, analyses it and returns aggregated anonymised data as feedback to teachers and leaders for more focused interventions and better decision making. Personal data is only viewed by another person with explicit permission: it belongs to the Learner. 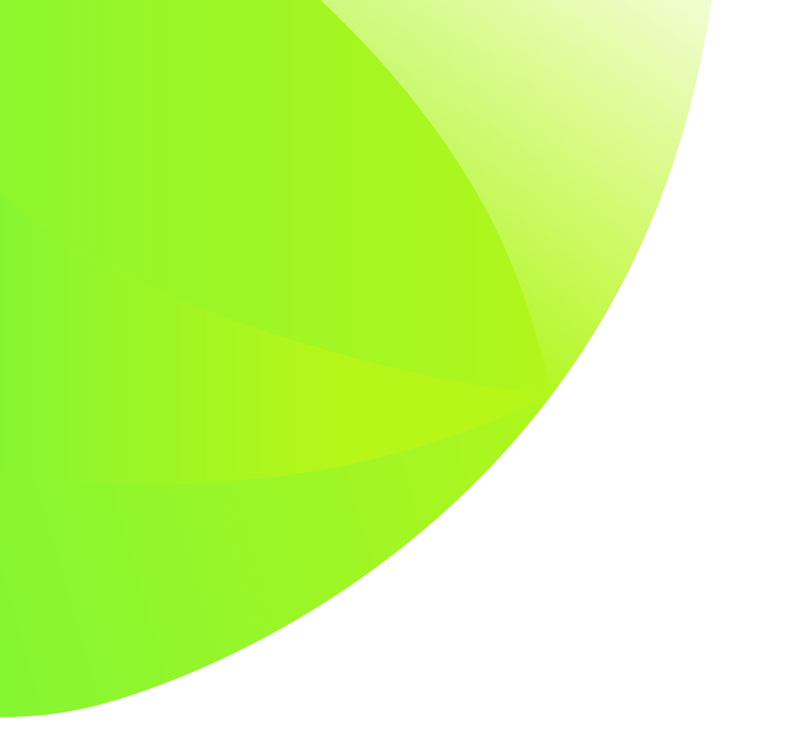 The focus for the next stage of the Learning Journey Platform is on enhancing the use of AI to support purposeful conversations – enhancing, not replacing, the fa ce to face relationships of trust, affirmation and challenge that are at the heart of learning. ‘Buddy’ already asks questions and ‘calls time’ for reflection at key junctures in each journey and he’ll get cleverer as time goes by. The second focus is on developing support and scaffolding for a whole authentic enquiry project. The Learning Journey Platform is available for use by schools and HE in this phase of development. Its capability to collect and integrate data around rapid cycles of enquiry make it an ideal candidate to support professional learning and improvement science approaches to educational transformation. 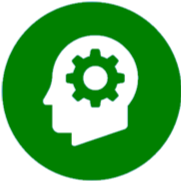 Its partnership with Declara – social learning and knowledge curation – mean that through the INSIGHTS tab capability users can access ‘knowledge pathways’ – units of relevant learning material which sit within Declara. The potential for scaling up professional learning across geographies and time is significant. This sort of education innovation requires new business models that allow for collaboration, innovation and evolution. The Learning Emergence Partnership is developing a wholistic approach where the same learning design principles are used in industry for cultural transformation both in terms of employees an d different types of users and customers. In between education and industry there is ‘community engagement’ and ‘vocational education’. Our vision is to make this work accessible for all schools, working with both industry and philanthropy. Learning Emergence has an asset locked Foundation to ensure this. The Learning Emergence team hosted an International Centre for Infrastructure Futures workshop at the Systems Centre yesterday to explore the synergy between ‘customer journeys’ as developed in the digital architecture of retail banking – and ‘learning journeys’ as developed by the Bristol team to capture the personal and social processes which contribute to the development of ‘resilient agency’. Dec Blue Partner Tim Crick, also a Learning Emergence Partner, showed how advanced customer decisioning technology can help organisations deliver agile and adaptive ‘customer at a time’ value management strategies across digital, assisted and face-to-face channels. This transformation in approach to customer management is radical – from a product/campaign centred approach to a ‘customer at a time’ Next Best Action Journey, from siloed channels to ‘joined up’ channels, and from ‘old data’ to ‘real time insight’ – its all about how to engage the individual in becoming resilient agents of their own financial journeys, rather than ‘telling them what to do’ and ‘selling them products they don’t really want’. Dec Blue is partnering with the Learning Emergence Partnership to explore this ‘joined up thinking’ through research and development. Lets just suspend our suspicion of the banks for a minute and explore these ideas. Ok – this is ‘commercial speak’ but we are Analogical Scavengers....and if we look at this from a different viewpoint,then it has many of the characteristics of learning journeys. The ‘person’ has a desire or a purpose. That purpose gives fuels their learning power. They figure out how to go about achieving that purpose, to persevere and explore all the relevant data and options available to them, in their unique context. They accumulate all that information, no doubt feel overwhelmed, and challenged as they figure out how best to achieve their goal. They get the help they need (online and offline) and finally settle on their preferred outcome. Once they move in they’ve achieved their purpose…they got what they wanted and needed which was a home of their own (not a mortgage!). 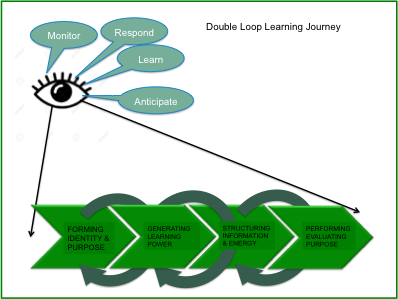 This is what we call a ‘single loop’ learning journey – just getting the job done. But if we use the same digital decisioning capability to ‘make the journey visible’ so that the individual learns how to go about navigating the journey itself more reflexively, asking more questions, challenging more assumptions and exploring more alternatives, then we’re actually enabling people to strengthen their learning power and become more discerning and effective in creating value. Just ‘willingly suspend your disbelief’ about the banks for a moment. The focus here is on enabling the individual to identify a purpose, to creatively explore what their options are, to find people and resources to help them, to collect the data they need to explore options, to make a decision and to implement it. Maybe the outcome is a NO. Still it’s a job done and its a learning journey. The journey has an architecture – stages, steps, transitions, interactions, triggers, beginnings and endings. The point is we have the technology and the know how to build this sort of digital decisioning infrastructure at scale. what if we tuned this technology to the challenge of CO2 reduction? 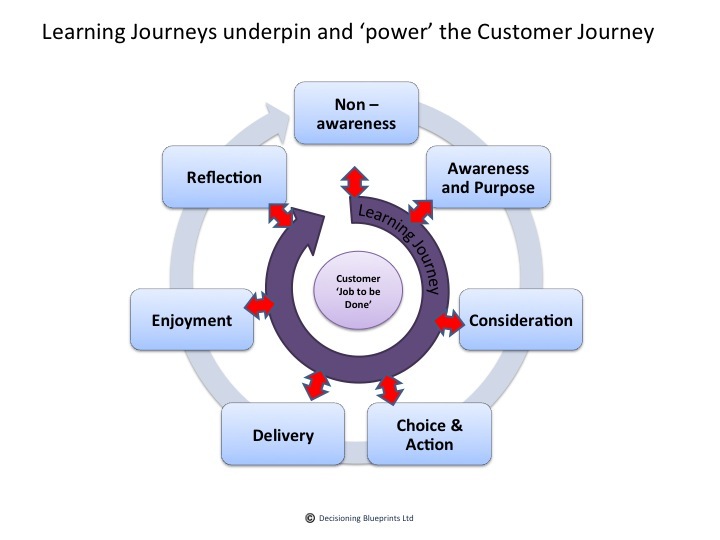 The ‘customer needs cycle’ matches the ‘authentic enquiry cycle’ ….. what we know about learning power and resilient agency adds value to this by locating the ‘customer’ (aka ‘learner’ or ‘individual’) as the primary agent of purpose and thus the driver of the process. Resilience is about mindfully navigating the journey between purpose and performance fuelled by learning power, which is the way in which we ‘regulate the flow of energy and information over time in the service of a purpose of value’. The dimensions of learning power simply provide a language and a focus for how we can go about this and get better at navigating learning journeys when we don’t know what the outcome is in advance. 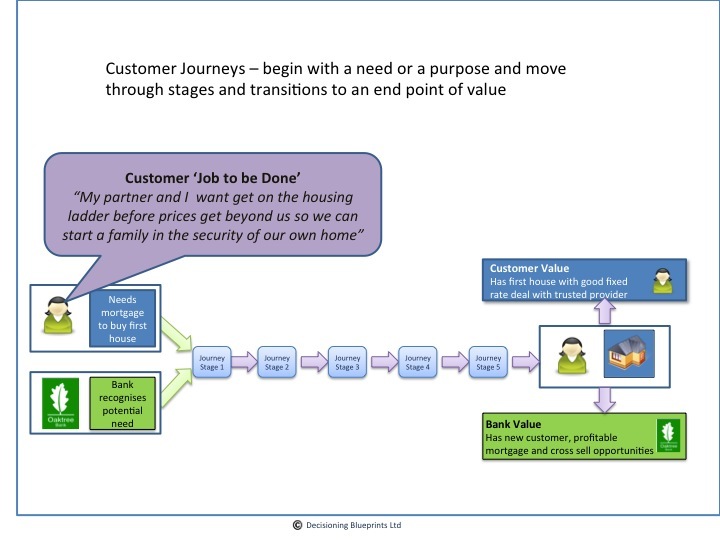 Learning Emergence Partner Steven Barr took us through the first steps of designing a customer/learning journey focused on ‘cycle to work’ as a job to be done which, if done at scale would have an impact on the overall outcome of CO2 reduction.